Norton rescue tools can help you to remove virus or other threats. These are helpful when your existing antivirus are not able to remove them. 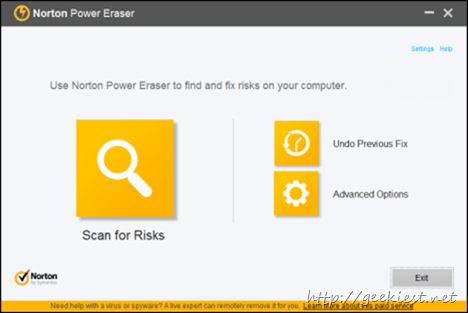 Two tools are available under the rescue section Norton Power Eraser and Norton Bootable Recovery Tool. This product is Free and will work with any security software you are using. This is a very aggressive scanner and remover of threats. It may also remove some legit applications also. You can undo the repairs done by this tool, so that you will not loose some legity applications. Also you can choose which all threats should be removed from the scan result. This tool can be used even in the safe mode. So if a threat not allowing you to boot into normal mode, you can login to safe mode and use Norton Power Eraser to remove that. This application will work only with an existing Norton product. Norton Bootable Recovery Tool will come handy if your computer will not allow you to boot. It can boot your computer via a DVD or USB and fix the threat. If you have an infected system and which does not allow you to install a security software you can use this. but remember to use this application you need to have a product key of a Norton security product.